A well-stocked liquor cabinet is a necessity for the classy gentleman or gentlelady who likes to entertain. Having the proper spirits and mixers on hand to make anything from a martini to a sidecar is always a solid way to ensure guests have a good time at your cocktail party. In the past, a beautifully crafted cherry or walnut liquor cabinet was enough to impress visitors with your affluence. These days, if you don’t want to look like a pauper, you have to take it a step further. [Elias Bakken] and his uncle [Mike Moulton] have decided to take liquor cabinets into the 21st century with a semi-automatic liquor cabinet called Latskap. The project is still in progress, and in the prototyping stage, but their build log on Hackaday.io is showing a lot of potential. It shouldn’t be long before they have a fully functional prototype finished. We’ve seen BarBots that will automagically pour you a drink, but how about one with RFID? How about one with Facebook integration, so your friends know how much of a lush you are? Wait. Facebook already tells them that. Huh. [Andy] and [Daniel]’s latest build follows on the heels of a lot of similar cocktail bots; an Arduino controls a few solenoid valves connected to a CO2 supply and a few bottles of liquor and mixers that allow drinks to be dispensed at the push of the button. Where this project gets interesting is its use of RFID and Facebook. The user interface was coded for Windows 7, with an RFID tag (ostensibly issued to each guest) allowing a unique login that checks an SQL server to see what privileges the user has. The app pulls the user’s Facebook profile photo down and displays it in the corner of the screen, and with the server keeping track of how many drinks (and of what kind) they had, with the right permissions it should be possible to post that info to their wall. Because we all know what you did last night, even if you don’t. Sure, the bar in this image looks pretty neat. But the video showing off its synchronization with the music brings it to the next level. The flashing lights and EL wire put on a quite a show that may make the bartenders feel like they’ve already had a few too many. The most amusing part of the project is that it all started from that half bookcase mounted on the wall. [Alexander Givens] and his roommate decided to augment its usefulness as a liquor cabinet by building a bar around it. But why stop there? LED Strips and 120 feet of elecroluminescent wire give the bar its inner glow. The illuminated lines are obvious, but the LED strip locations may not be. Several of them light the shelves hosting liquor and glass wear. The bartop itself is made of glass, filled with 75 pounds of marbles, and lit from underneath by the rest of the strips. 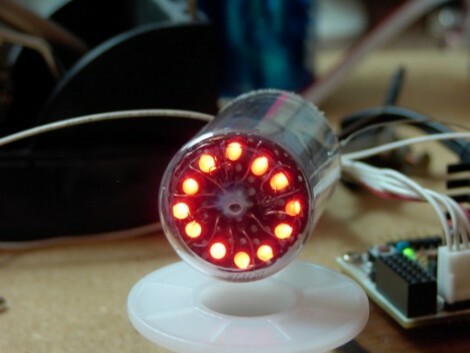 An Arduino Mega with an EL shield drives the system. The guys built a rudimentary control interface that looks partially spill tolerant. It’s located just under the inside lip of the bar. Their costumes came out pretty well too. But with a built-in centerpiece like this they may want to upgrade to a more accurate replica. What better way to watch the Olympics than having a robot pour you a shot every time the United States wins a medal? The folks behind SmartThings did just that, by creating a machine that pours some liquor for each American Olympic win. From the behind the scenes video, we see the entire build is controlled by an Arduino with an XBee shield. The XBee is connected to a simple iPhone app where the current user watching the Olympics can select which medal the US won. Bronze dispenses a shot of Jack Daniels, Silver is a shot of Jose Cuervo, and Gold means someone in the room is getting a shot of Goldschläger. Even though the build revolves around the SmartThings framework, we’re not really quite sure what this framework is. From the Facebook page (the best source of info for SmartThings, at least until they launch), it looks to be a piece of hardware that serves as an Internet to XBee bridge, along with a framework for easily whipping up a mobile app. Whatever SmartThings is, it’s still a very cool build. Think the swirling glow of a Decatron is cool but don’t want to deal with the voltage issues? [Osgeld] sidestepped the problem by developing a fake Decatron. Admiral Nelson (Captain Morgan’s cheaper cousin) provided the enclosure in the form of an airplane sized liquor bottle. The LEDs are common-something (not sure if it’s anode or cathode) so they end up being individually addressable through the mess of wires coming out the end. This will greatly simplify that kitchen timer we’ve been meaning to build. See the blinking lights go around and around after the break. [Qdot] came up with a simple way to dosing out liquids to use in his Bartris project. As you can see above, flexible tubing is connected to some inverted bottles that house the liquid. A chopstick is attached to a board on one end, and via string to a servo on the other. When the servo turns it pulls the chopstick tight against the board, cutting off the flow of liquid through the tubing. This isn’t as elegant as the system the Bar2D2 uses but it’s a heck of a lot less expensive. You can check out some of the build pictures in his Flickr pool. He’s included this concept in a project he calls Adult Mario. Watch the video after the break but the quick and dirty is that the more coins you score in Super Mario Brothers, the more beverage is rationed out into your cup. Ah, human lab rats, is there nothing they won’t do for booze?